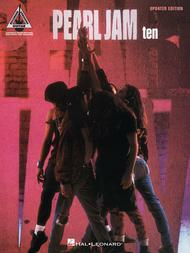 By Pearl Jam. Hal Leonard Guitar Recorded Versions. Grunge and Hard Rock. Guitar tablature songbook (softcover). With guitar tablature, standard notation, vocal melody, lyrics, chord names, guitar chord diagrams, guitar notation legend and black & white photos. 110 pages. Published by Hal Leonard (HL.694855). Matching folio to their break-through album including 11 songs. Includes: Alive * Black * Deep * Even Flow * Garden * Jeremy * Oceans * Once * Porch * Release * Why Go. Also features photos. It's alright some of it is not exactly spot on. i.e. 'Oceans' is just plain wrong. And 'Even Flow'. But otherwise most of it is good. i don't think the evenflow tab is accurate. well, definetly this album has left a great sound of grunge, have one word "INTENSE". November 18, 2002 Simply the best. It is the best thing I have ever seen!!! best attribute is that Eddie Vedder sings from the soul.